Discussion in 'Massive Tutorials' started by Zacatero, Mar 14, 2016. This tutorial will serve as a guide to making shops with the MassiveLock plugin. My example in this tutorial will be making a shop that sells Cookies. Lock the chest with the lock. I suggest doing /lock tool and using the enchanted stick it gives you. you SHIFT+CLICK the lock to see the ACTUAL inventory of that chest. Q: Can I add more than one item to my shop? A: Yes! Just use the command in step 4 for each item you want to add! Be sure to limit the amount of items in one lock to 54, due to the limitation o the lock GUI. If you have more simply create a new lock. You can also add 1 lock for each item if that is how you prefer your shop to look. Q: What is this part of the /lock show that says ShopAccount? Can i change that? A: The shop account just tells you who the money goes to/comes from when using a shop. Although it is editable, you can only set yourself. Q: Why do i see "Massivelock has overridden use access" when I click a chest? A: This simply means that under normal circumstances, you wouldnt be allowed to open a chest/door there. Since Massivelock overrides all other plugins for access its allowing you to use this door/chest since you are added to the lock or its public. Q: I'm afraid i might accidentally put the prices to sell higher than buy and i will lose my money. Q: There are blank spaces in my shop GUI. What are they? Why are they there? A: There are two parts of any shop. The physical chest and the lock information. So those blank spaces are simply an item that is added to your lock information, yet is NOT in the chest. So that blank space is where that item WOULD be if it was in the chest. A simple way to manage these is to keep track of what is purchased and if you have no more of that item, remove that item from the lock information. Remember y'all, the staff are working hard to make these commands easier and more user friendly! I will add more info below from other threads that i feel are relevant. In theory, the MassiveLock shop feature works on all "containers" whether that being chests, trapped chests, minecart chests, hoppers or other. Can i add more than one item to my shop? The shop account just tells you who the money goes to/comes from when using a shop. And no it cannot be edited by players at the moment. This will default to amount being 1 of nothing specified. Step 6. Wait until Madus makes this more user friendly. It sounds like you have too many parts on that one lock but I'm not sure. Try doing /lock create again and then doing the rest of the tutorial. "/lock edit shopprices add item B#" - what's the "item" part? If I use "item" it says item is not a regal value. I feel like I'm really close. "Invalid Shop Price "Hand B5"
Im so sorry yall! when i first made the shops "item" worked fine. The main text in the OP has been edited as has the picture in the STEP FOUR spoiler. This just means that.. under normal circumstances, you cant open the chest. But massivelock overrides all other plugins for use access. So if you arent added to a region, but you ARE added to a lock (or the lock is public) then you can use it anyway. That is the override message purpose. How do I see the things prices of the things inside my chestshop as in step five? Other people can see my prices, but I can not. You can't. Not sure of its a glitch or not. If you open your chest and click the show button, and then the right arrow on the top, you can see a list of your prices you have for that shop. 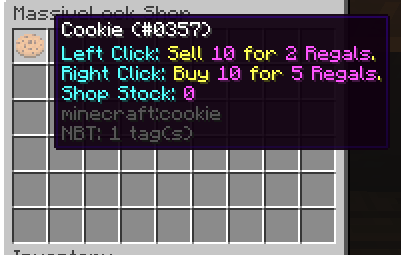 If you hold the item that you want to sell in your hand just type /lock edit shopprices add b5. That worked for me. I do believe I heard one of the tech staff say that you should be able to see your own prices in a shop lock and that's being worked on. Don't quote me on that. The argument "hand" or "item" is not required anymore. We thought it would be most convenient for the players if you always add the shopprice simply for the item you are holding in your hand. It'll be included in the next server update, madus already completed that. Lol I'll edit the OP again when I get back to my PC. That's normal, I think! It means other players are allowed to open it, whereas usually due to perms in the market space they wouldn't. It overrides the old plugin is what it means. Except they can't open it. It gives that error and that's it. They see the orange sparkles for a chest shop but it acts like a regular chest. I've tried everything listed in this thread. I just cannot figure out what's wrong. @Gethelp has a test chest shop that is doing the same thing. While you can't physically see it within the chest, you can do /lock edit shopprices show to list all of your set prices. WorldGuard is buggy, I think. It works for double chests not single chests and it is really silly. Mine were single chests. I'll give it a try! Eureka! It works with double chests. Thank you! My suggestion to accommodate this is to include the word SHOP in all of your shop locks. So when people click it and see the name in their chat.. they will understand that it is a shop, regardless of it being a hopper, dispenser, etc. It'd be cool if it applied to item frames and what not as well, altohugh I can see why that wouldn't work. I'm having some trouble with my chest shops.They were all switched from shop to private and when I tried to switch them back, I got this error. I tried switching to public, but that just made all the goods inside my chest free to the public. When I use the "show" command, I can still see prices for everything inside the chest. @Madus did something happen with the shop lockmode? Last time this happened they were fixing some bugs with MassiveLock Shop mode. This is probably the case again. No worries, once the shop mode comes back all your shop details will still be saved by MassiveLock. You'll just have to set it back to shop. Sadly there is Spigot bugs which causes this to not work. So sadly I cannot say. The lock shop system is now enabled again. That took a while but we hope it can remain online now. @Cayorion said in his broadcast that this change was not only to allow more than one player to shop at once... but until this change... if your shop was buying from the players (meaning they sell to you) they couldnt see what was available to sell! Do you know if the shops can work in a dropper or dispenser in regalia? I've tried a few times but have had no luck allowing players to bypass a lock in a region. I'll give it the god ol' alt test rn but I'm sure I'll have the same result. Here is what i know since i do not have experience with shops and dispensers/droppers. I also do know that Areashop + Singlechest shops do not mix well. It might be the same issue with dispensers/droppers. I think because of the new GUI linking to the lock and not the dropper, any storage system can work now and bypass the region. This probably means you could put 52 items in a vault in the factions, and then use a dropper in regalia to receive said items. In short, this has potential. I asked in game. It still only allows you to buy and sell from the specific container that you are clicking on.